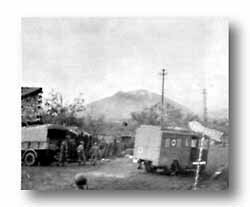 The capture of the Camino - Maggiore hill mass and Mount Sammucro had been of vital importance but the battle for the Migano Gap was not yet completed. 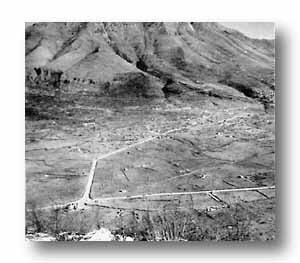 In the heart of the Gap stood Mount Lungo, dominating Highway 6 and overlooking San Pietro, desperately held by the Germans against all our attacks. Lungo's slopes were milder than either Maggiore or Sammucro but they were rocky, barren and well fortified by the Germans. At its base the enemy had cleared away all the trees and vegetation for unobstructed fields of fire and the approaches to the mountain were heavily mined. An Italian brigade tried to take Lungo from the South but met with disaster. A week later the 142nd Infantry, still tired from the Maggiore mission, was assigned the task of seizing Mount Lungo. Before daylight of December 15 the two assault battalions of the 142nd were hidden on the lower eastern slopes of Mt. Maggiore to await the coming evening. 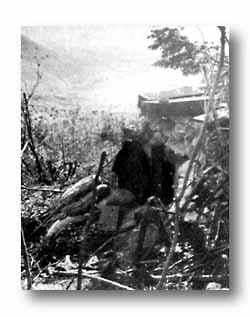 Early that night, Lt. Col. Graham's 2nd Battalion jumped off, swinging around Lungo to attack it from the north and rear, while the 1st Battalion, Major Elliott W. Amick commanding, struck directly across the intervening valley to attack from the west. The enemy was caught completely by surprise, many of them asleep in their holes. MT. LUNGO'S strategic advantage can be well-approximated in this photo looking down from it onto the intersection of the lateral mountain road from Venafro and San Pietro with Highway 6. Shortly after Lungo's capture, 16 German vehicles and tanks fleeing from San Pietro were intercepted and destroyed by our military observer in this position. (Below) Barren and rocky, Mt. Lungo lies astride the valley opening at Mignano Gap. Rock and timber shelters and heavily-mined approaches aided the Germans in holding this important ground despite large masses of artillery that were directed upon it. Objectives were taken rapidly, the Germans being flushed out by grenades and bayonets. Mopping-up continued throughout the night and early morning. At daylight our artillery observers with the infantry on Lungo spotted highly lucrative targets -- German vehicles and tanks fleeing San Pietro, a German vehicle park, and troops being rushed uup to make a counterattack -- and called down massed fires with effect. Lungo was ours. The loss of this feature caused the enemy to withdraw from battle-scarred San Pietro. 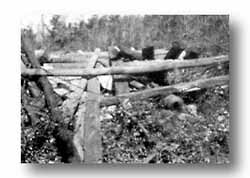 RAILROAD TIES, telephone poles, local stones and sandbags went into the construction of German shelters on Mt. Lungo. These enabled the enemy to withstand heavy artillery bombardments. THE GERMANS blew this 57mm gun position prior to pulling out. 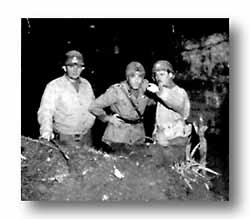 LT. COL. ANDREW F. PRICE, Executive Officer, and Col. Richard J. Werner, Commanding the 141st, orient an Italian artillery commander on the Lungo objective before the Italian attack. THE 155TH FIELD ARTILLERY BATTALION turns its 155mm howitzers on Mt. Lungo. Vehicles are British.